Ohris’s has quite a bit of space in the two stories they occupy at Hitech City. 100 degrees is located in the ground floor. The décor is casual and smart. Some of the staff are dressed as cowboys carrying plastic guns in holsters. 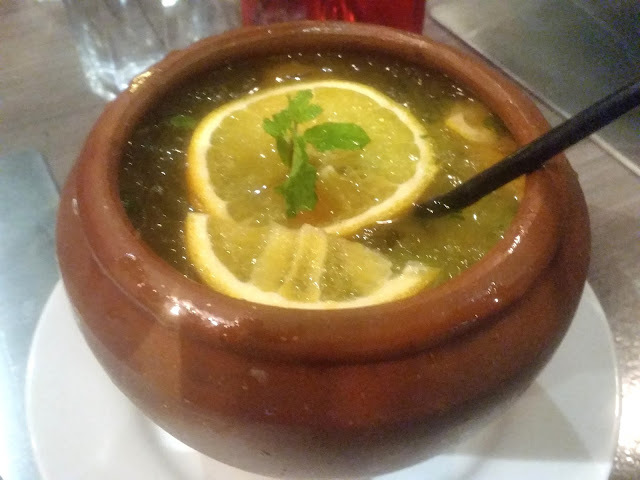 As we settled down, I ordered one of the Matka Refreshers from the menu - based on advice of the staff, my choice was Jeera Mar ke – lime and jeera based drink which was very soothing. The presentation as you can see from the photo is quite ethnic too. My friends also ordered their own drinks, and one I liked and tried out subsequently was called Chatka Orange. For a start we tried out their signature 100 Degrees Nachos – tortillas with lots and lots of cheddar cheese served with salsa. Very decent. 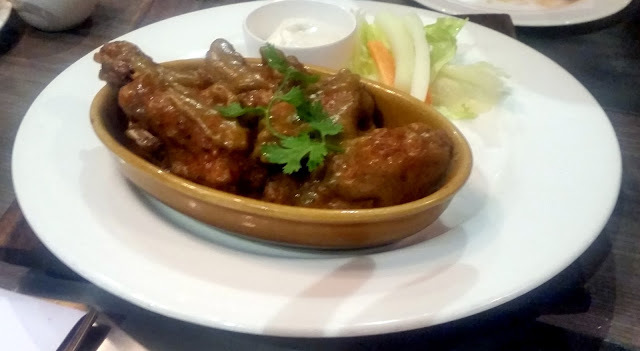 100 degrees has its version of Chicken Wings test – where you try out wings in various sauces at an increasing spice level. 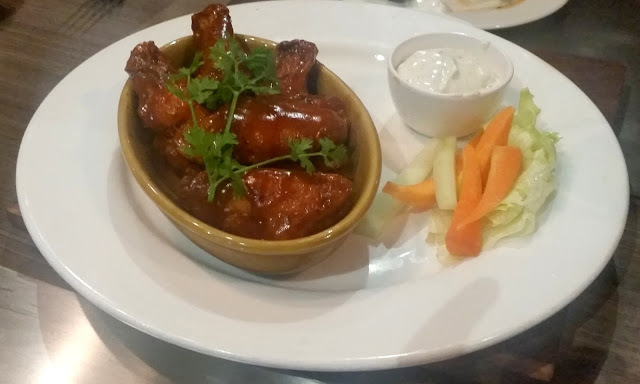 Out of the six we tasted, I liked the honey mustard based Beginner’s Wings, Raise the Alarm Buffalo wings and the one with smoky barbeque sauce. 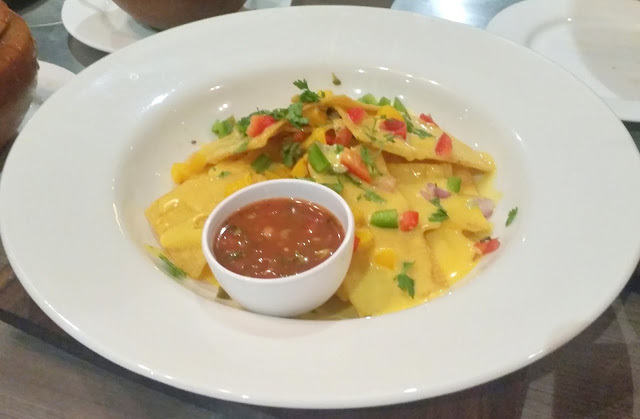 The spiciest had the dreaded Bhut Jolokia chillies – it was overpoweringly hot for sure but lacked any other taste. The fire burning in our mouth were quickly doused by some Caesar Salad and Florida salad. The pastas and pizzas followed. 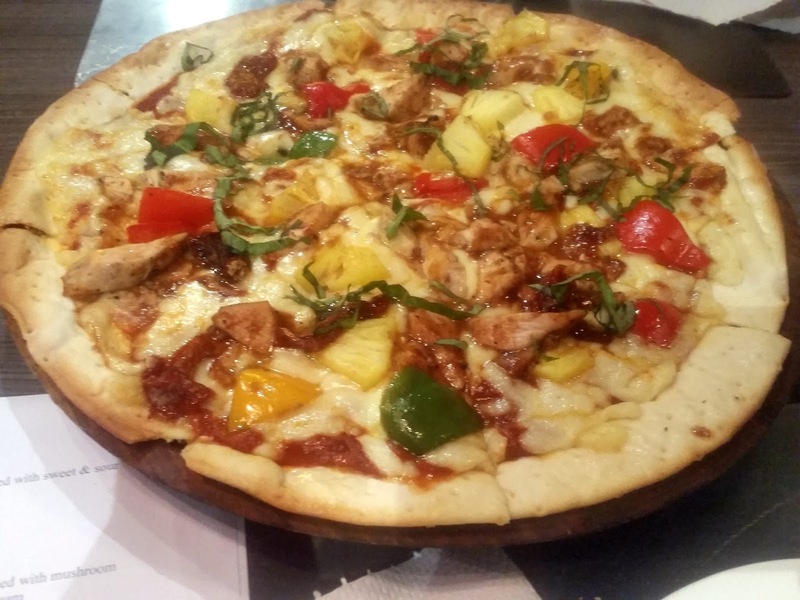 We tried three types of pizzas – California BBQ Chicken was the one I liked with a topping of tomatoes, olives, cheese and capsicum apart from the chicken. A non-traditional pasta in their own smoky barbeque sauce was a winner for me. The rest of the pizzas and pastas were really not too special. Finally, it was time for what I was waiting for – the sizzlers. 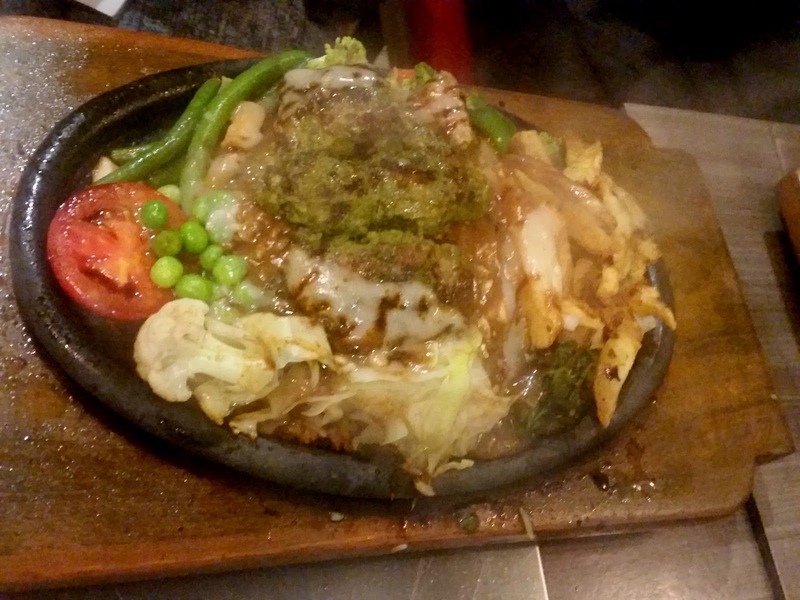 We shared four sizzlers among us and as had been my experience in their earlier outlet, most of them were very very good. The one which came on top was their Prawn Sizzler which had grilled prawns served in a spicy and tangy sauce, with mashed potatoes, beans and carrots, potato wedges and a bit of spinach as sides. Highly recommended. The Coriander Fish Sizzler which had fillets in a green marinade served with rice and sautéed vegetables was not far behind, especially for a coriander leaf fan like me. 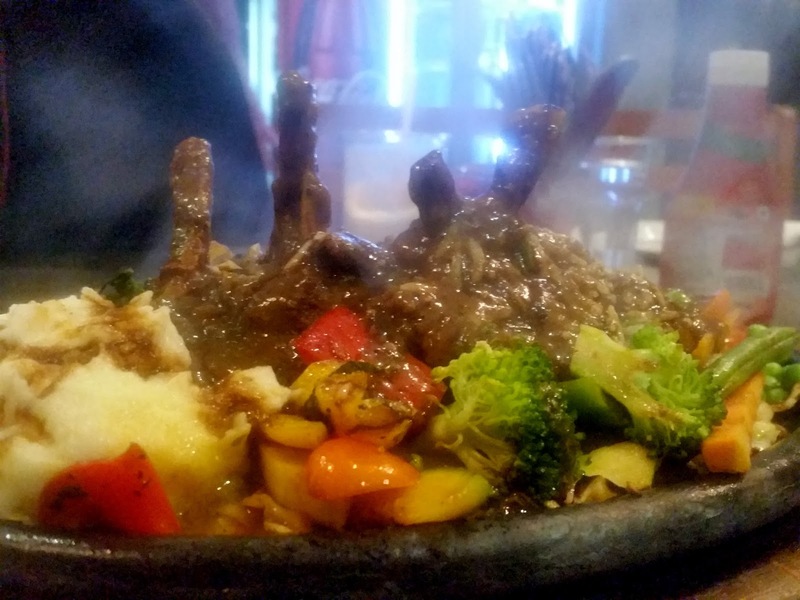 The Mixed Grill Sizzler, which had a lot of meat like chicken sausage, kidney and liver had a nice pepper sauce, but the usual problem of mixed grills of some meat being overdone took some sheen of it. The Mutton Chops sizzler was nice to look at, but the taste did not live up to the looks. Overall, their sizzlers still remain quite good. The desserts included some delightful Sizzling Walnut Brownie as well as cinnamon flavoured Classic Apple Pie. I would recommend this place mainly for the huge variety of sizzlers that they have. The refreshing drinks served in a matka are also quite good. Friends who tried their cold coffee went gaga over it.